Staff Photo by Matt Fields-Johnson Lab analyst Kim Durham triturates samples of drinking water to test for alkalinity and hardness at the Tennesse-American Water Co. treatment plant in Chattanooga. Area residents turning on the tap can expect their water to meet federal and state regulations, but that might not mean the water is free from contaminants, water experts say. 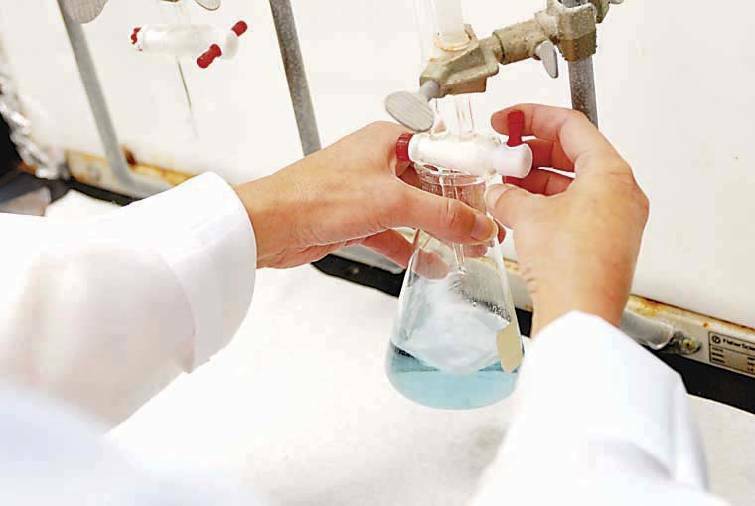 Federal and state inspectors test water purity by using regulations mostly set in the 1970s. Numerous chemicals have come on the scene since then, but regulators are not required to test for many of them. Opinions vary on whether that means tap water is safe. Inspections in Southeast Tennessee during the past 18 months have resulted in 209 notices of violations at 15 of the region's 87 water systems. A University of Tennessee at Chattanooga researcher who recently found traces of pharmaceuticals in local drinking water said he did not spot anything that made him conclude the water is unsafe. "Just because we measured (the presence of pharmaceuticals) doesn't mean there's harm," UTC's Sean Richards said, adding that the levels detected were low. "If we could take (the equivalent water of) 12 Tennessee Aquariums and grind up one Tylenol and put in the water, we could detect it. I was encouraged by what we found." Safe-water advocates, however, say an encouraging assessment should not drown out concerns. Renee Hoyos, executive director of the Tennessee Clean Water Network, pointed out that scientists and regulators did not think years ago that the insecticide DDT was dangerous. She said that while government regulation requires water systems to be free of contaminants such as bacteria and mud, regulators are not staying up with the emergence of pharmaceuticals and industrial chemicals that might end up in a glass of tap water. "The EPA requires that drinking water plants test for about 100 chemicals, and that's a very short list of (all) chemicals that we know are out there that could be in water," she said. As the population in the Southeast grows, more contaminants -- prescription drugs, estrogen from birth control pills, even aspirin -- are flushed into drinking-water sources such as the Tennessee River, officials said. In addition, industrial pollutants enter some water systems after disasters such as the TVA coal-ash spill in Kingston, Tenn., late last year and when chemicals leach into the ground water at factory sites, records show. Government regulations, first enacted with the Clean Water Act and the Safe Drinking Water Act in the 1976, have been updated twice, most recently in 1996. Federal regulators "continue to analyze the data and information," said Laura Niles, spokeswoman for the U.S. Environmental Protection Agency, adding that "the science is still in the works." Water providers such as Tennessee American Water and Dalton Utilities are determining how to monitor and deal with newer substances in their water systems. Among substances absent from federal and state regulations is PFOA, or perfluorooctanoic acid, sometimes called C8. The substance is used to make cookware slick and to ensure that fabrics are water- and stain-repellent. The EPA has labeled it a likely human carcinogen. It has been detected in high levels in the Conasauga River, the water source for Dalton, Ga., records show. Ms. Hoyos said wastewater moving through a stream or river can contain other unhealthy substances. "We've discovered that from the wastewater -- that downstream becomes someone else's drinking water -- is all this other stuff we never thought of, stuff that's as innocuous as caffeine to something as powerful as methamphetamine," she said. "It's hard to determine the dose you're getting at any particular time." Mark LeChevallier, director of innovation and environment stewardship for American Water Co., the parent company of Tennessee American Water, conducts lab tests on water samples from the 32 states where company facilities are located. American Water has been tracking the pharmaceutical and personal-care products issue for more than a decade. "As a team, we can provide resources and share expertise and coordinate our programs," he said. However, even water company research is hampered by the lack of the standards for emerging concerns, Dr. LeChevallier said. He said company officials once sent identical test batches to two major laboratories and found widely divergent results because -- with no government guideline prescribing standard testing practices -- the labs used their own methods. "It's critical that EPA develop standard methods and provide proficiency testing and laboratory certification for this," he said, "because right now if you send out samples you have no confidence the results you get back are actually true or not." When a University of Georgia study revealed presence of PFOA at high levels in the Conasauga River several years ago, officials at Dalton Utilities said they could not test the water without standards from EPA or state regulators. Becky Champion, assistant branch chief with the Georgia Environmental Protection Division's Department of Natural Resources, which enforces EPA laws and rules, said even the agency's "advisory" for the compound "is not anything we can enforce." In Tennessee, Tisha Calabrese-Benton, spokeswoman for the Department of Environment and Conservation, said pharmaceuticals also can be detected but not yet monitored and regulated because no safe standards exist for those compounds. "It's important for the ongoing protection of human health and the environment that regulations evolve as technology improves and more information becomes available," she said. When problems are spotted with contaminants that are regulated, state water officials require utility companies to find new water sources if the issue cannot be corrected. One example is the Walden Ridge Utility District on the north end of Signal Mountain. Gary Burriss, Chattanooga field office manager with the Tennessee Department of Environment and Conservation, said the district had to seek a new water source in 2006 when the chemical TCE, a degreaser, was discovered in its wells. The utility, which serves 7,044 people, now buys most of its water from Tennessee American Water Co. and the rest from Hixson Utilities. According to regulators in Tennessee and Georgia, tap water in both states is safe. Dr. Champion, Northwest Georgia's microbiologist and regulator, said she drinks tap water every day and has much more confidence in it than in bottled water. "The rivers and streams are much cleaner now than they were before the Clean Water Act," she said. * In the United States, water utilities treat nearly 34 billion gallons of water every day - enough to refill almost 31,000 Tennessee Aquariums daily. * Children in the first six months of life consume seven times as much water per pound as the average American adult. * Tennessee has 485 community water systems, serving 5.8 million people. There were 49 health-based violations affecting 297,600 people, according to 2008 EPA records. * Georgia has 1,764 community water systems serving 8.1 million people. There were 81 health-based violations affecting just over 500,000 people, according to EPA's 2008 compliance database.